Rekha Devi is a 42 year old woman resides in bedo panchayat, of Ranchi District, Jharkhand. She has a small family with her husband Manoj Soni (45), father in law Bhola soni (70) and a 4 year old daughter Komal Kumari. Farming is the only livelihood option for her family which makes them earn 2000 rupees a month. She was very well aware about the entitlement for her family under National food Security Act. For the last 3 years, she was trying hard to get ration card and she was continuously visiting ward members and Mukhiyas for the clearance for her documents. As per the process the team of panchayat level officials verifies the eligibility of applicants. Being an applicant of Antyodhaya Card holder, she was denied of benefits she is entitled to receive. She was clueless of the denial and to find an answer she paid a visit to Soochna Seva Kendra, bero block. To understand the whole situation, the team verified her required documents and found out that the address mentioned in her Aadhar card was of different panchayat and she was submitting her application in bero panchayat. However her name is registered in the voter list of bero panchayat. The whole problem started when the family of Rekha devi migrated from Patrik village to bedo. Illiterate Rekha didn’t notice that her aadhar card has the address of Patrik village where she used to live before. It is clear to Soochna Seva team how to step ahead. The result of which she got a renewed Aadhar card, applied for ration card and submitted to the dealer. 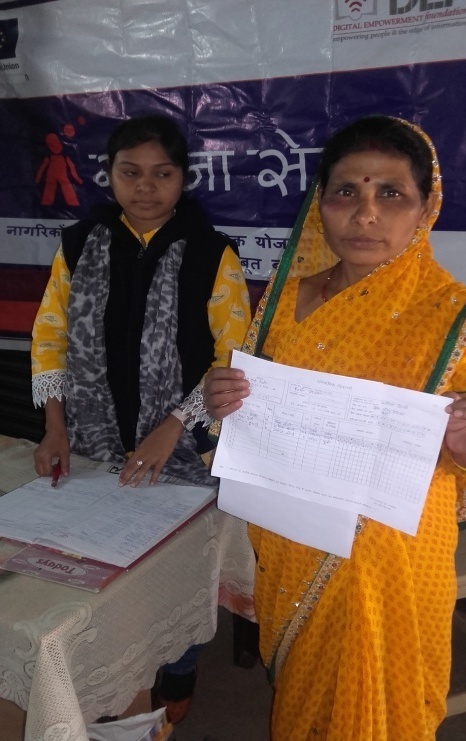 Few days later, Rekha devi again paid a visit to Soochna Seva Kendra and applied for Sukanya Samriddhi Yojana for her daughter Komal Kumari.